Latest Update: The Indian Navy Sailor MR Aug 2019Notification is released & the last date to apply is Dec 30th, 2018. And the Application link and Official notification are given at the bottom of the article. 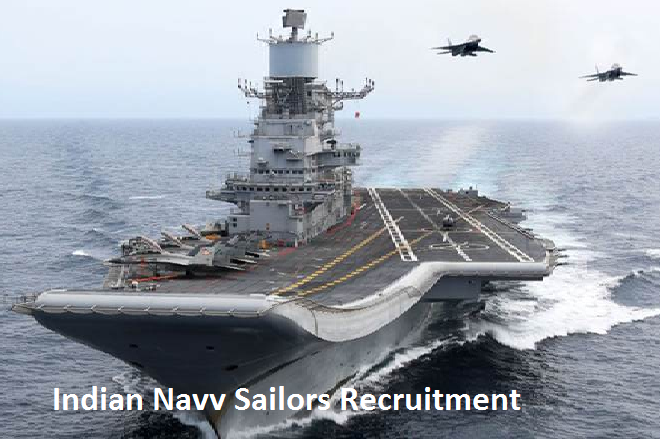 Indian Navy Recruitment 2018 – Apply Online for Sailor Posts: Indian Navy (Indian Navy) has advertised a notification for the recruitment of 400 posts of Sailor vacancies. Eligible candidates can apply online from 14.12.2018 to 30.12.2018. Other details like age limit, educational qualification, selection process & how to apply for Indian Navy Jobs are given below. During the initial training period, a stipend of ₹14,600 per month will be admissible. On successful completion of initial training, they will be placed in Level 3 of the Defence Pay Matrix (₹ 21,700- ₹69,100). In addition, they will be paid MSP @ ₹ 5200 per month plus DA (as applicable).